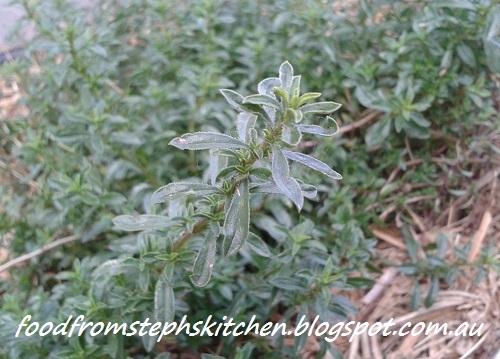 Fresh thyme is a great plant to have in your garden. Thyme seems to be one of those herbs that is a jack-of-all trades so to speak, going with almost anything you want to throw together. It goes with not only red meats but also your white meats, such as fish or chicken. Unlike some other herbs if also plays nice with vegetables and eggs. About the only thing thyme can't do is sweets ... no surprise there though! Myself - I think thyme and chicken are a match made in heaven - so it is my go-to herb when cooking with chicken, and I absolutely love thyme with mushrooms. Something that my Mum told me long ago and a lot of people might not know is that thyme is a key ingredient in the mixed herb mix you buy in the shops. Next time you open the container just have a smell and you'll know what I mean. Knowing this I always use mixed herbs when I could thyme as a rule of thumb. I love growing thyme because it seems to be one of those tough little herbs that seems to just keep on growing - no matter what happens to it! I've had mine almost be twig like with the heat on the underneath of the plant yet it just kept sprouting new sprigs for me on top. In winter it seems to keep very stable and although slows in growth still allows me to hack away at it for my stews and casseroles. As I mentioned before if I don't have thyme I simply use mixed herbs as a substitute, but you can also substitute it with basil, marjoram or oregano. If you are cooking with fresh thyme you can add the little leaves whole or roughly chop them and sprinkle them into your dish. You can add whole sprigs of thyme to stews or casseroles - as a rule of thumb if you are simmering the dish down I would use the sprig as I think it adds extra flavour. I do the same with rosemary which is also a woody stemmed type of herb. 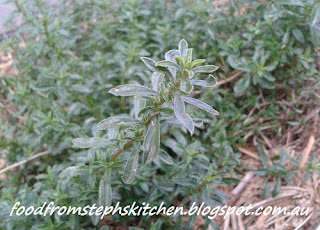 There are many different types of thyme including lemon thyme - which my Mum swears by for fish! Try sprinkling a little bit of mixed herbs or thyme on your mushrooms next time you are baking or frying them up - and using butter while cooking them is a must! You can keep fresh thyme in the fridge for up to a week if you wrap it in a tea towel and then wrap it tightly in cling wrap. I have also found that wrapping them in cling wrap alone is enough. I absolutely love adding thyme and cubed apple pieces in my stuffing. It adds such great flavour to the chicken, and the apples add that touch of sweetness.